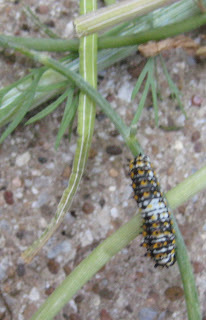 At the end of May I found this young caterpillar devouring my small dill plant. 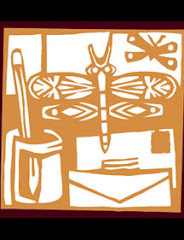 Busy packing for a road trip, I figured the caterpillar could come along and keep me company. So I fixed up a Ragu jar with lots of holes in the lid, and cut what little was left of the dill. The dill and the little caterpillar went into the jar. 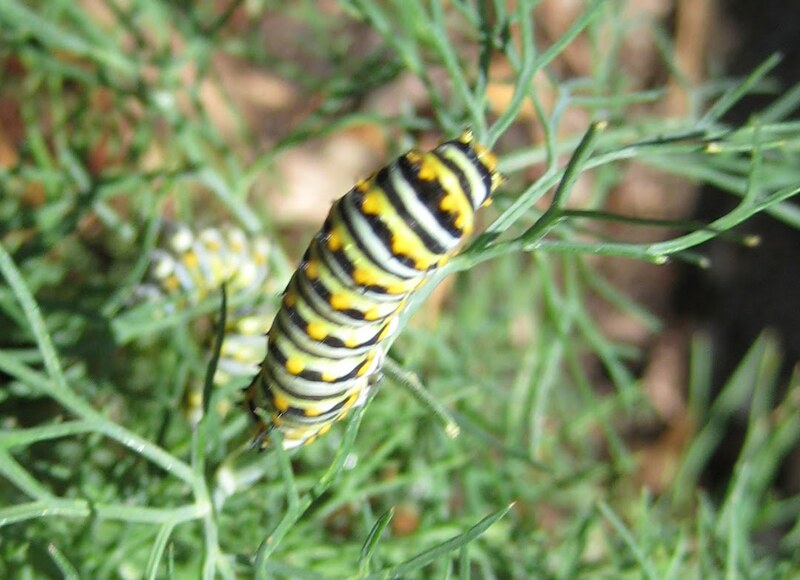 Overnight, the caterpillar ate nearly all of my dill. I loaded the caterpillar and jar into the cupholder of the Buick. Before I hit the open road, I hit Albertsons to score more fresh dill for road munchies. Lest you think me totally insane, there's some history. When we arrived at the University of New Mexico to move the Woolly Mammoth into the dorm in 2005, his roommate had already claimed his half of the room. The roommate was totally organized with a flat monitor computer, espresso machine, and a beta fish in a bowl. Stunned, I asked how he brought the fish to college. In the cupholder, of course. A couple years later beautiful caterpillars began to eat the dill plant in our school garden. Each day the preschoolers went to the playground to observe the hungry caterpillars. One day we realized the caterpillars were shrinking because they were being eaten alive by fire ants in front of the children's very eyes! The kids didn't end up in therapy, but I was scarred for life. The Ragu Rider caterpillar was happy eating and listening to the audiobook of Doctorow's Homer and Langley. On arrival, I made larger accomodations for my trip buddy in an old Tupperware juice container. 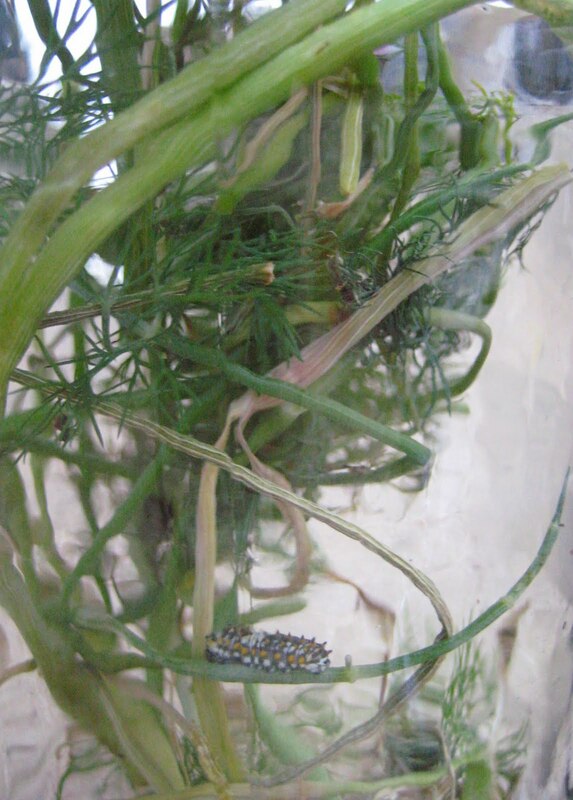 I got more dill at the new HyVee store, and the caterpillar kept eating and eating. Checking in each evening was about the highpoint of the trip. 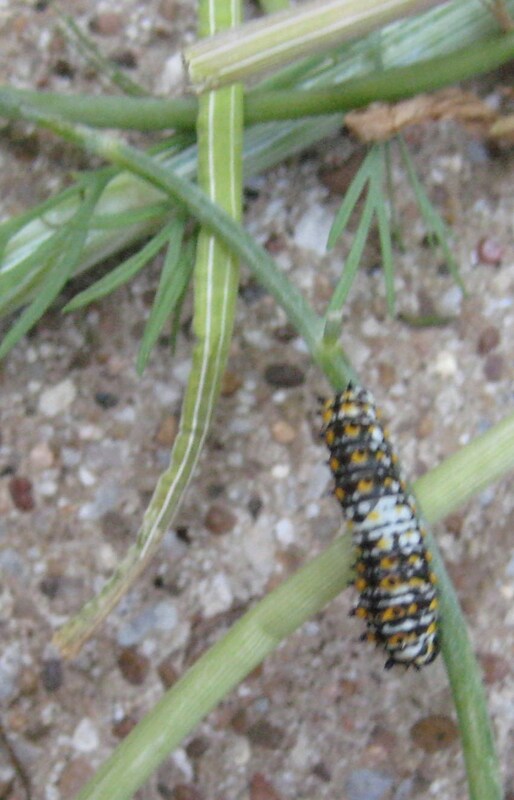 The night before the two of us were to drive back to Texas, the caterpillar was nearly the size of my pinkie, and handsome with yellow and black stripes. I added long sticks in case the caterpillar needed to start a chrysalis. I explained that it would soon be a star in the preschool classroom when we would watch it turn into a butterfly. Alas, in the morning the caterpillar was no longer star-material, or educational, either. Maybe it didn't want to go back to Texas. Maybe it didn't want to listen to Simon Winchester read his own book, The Man Who Loved China. Maybe it didn't want to watch me cry for fifty miles after I said goodbye to my father. Maybe it was just sick of eating dill. Dill is a member of the "umbel" carrot family. 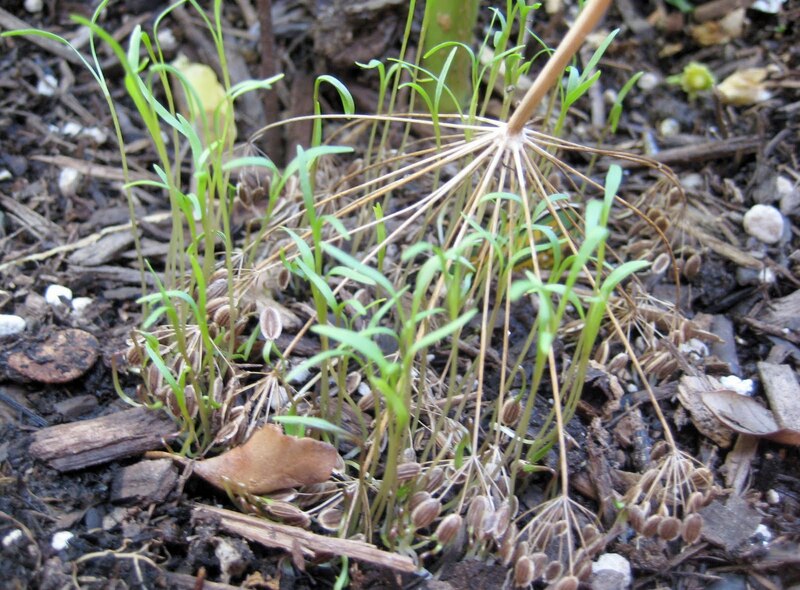 Its plant has an umbrella structure with seeds at the tips of the radial spokes. I heard about "umbels" on a guided nature hike at the Connemara Conservancy last fall. The brilliance of the structure didn't fully sink in until this week. When we removed the dead dill plant from the school garden, I brought some stalks home. It was starting to rain, so I just plunked the "umbrellas" down in the dirt. 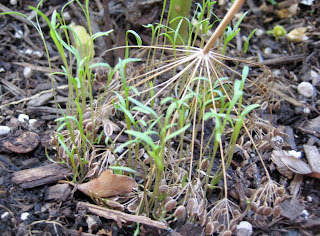 After the rain, the dill seeds had sprouted in a circle. In the wild this would happen wherever the stalks bent down to the ground, spreading ever outward. I'll be glad if the dill grows tall, as I love cutting it into salads. Happy I will also be if caterpillars mow it to the ground. 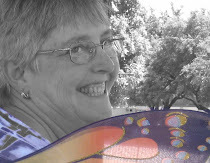 I'm just wishing for a classroom chrysalis.